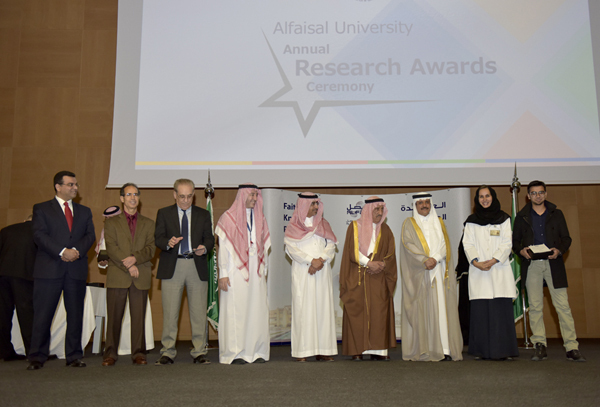 Annual Research Awards Ceremony 2016 held by Alfaisal University to honour students, faculty and Alfaisal partners. More than 200 students, faculty and Alfaisal University partners & friends were honoured on 16 February 2017 at the Princess Haya bint Turki Auditorium in recognition of their research contribution to the University. Winners in the 6th Annual Research Day Student Poster Competition received trophies from the HE Dr Mohammed Alhayaza, Alfaisal University President, Dr Faisal Al Mubarak, Vice President & Chief Academic Officer, HH Dr Maha Al Saud, Vice President for External Relations, Dr Khaled Al Kattan Vice President for Administration and Finance, and Dean of Medicine, Dr Nouredine Zettili Acting Dean of Science & General Studies, Dr Nidal Nasser Acting Dean of Engineering and Dr Bajis Dodin Interim Dean of Business. Students who received Boeing Student Research Awards, those taking part in the Boeing Solar Car project, and those taking part in the Shell Eco-Marathon Challenge to build more fuel efficient cars were also acknowledged, as well as students who won in the 5th KAUST International Undergraduate Research Competition. aculty Awards for Research Excellence were handed to Dr Ahmed Yaqinuddin from the College of Medicine, Dr Samir Brahim Belhaouari from the College of Science & General Studies and Dr Redha M. Radaydeh from the College of Engineering. Patent Awards were handed out to Dr Hassan Zohair from College of Engineering, Dr Edreese Alsharaeh, Mr Ali Othman and Mr Khaled B. AlSaud from the College of Science & General Studies as well as Dr Mohammad Ateeq AlDosari from KACST. The audience was then thrilled with an exciting and informative talk from the Honorary Guest Speaker Mr Yousef Abdullah Al-Benyan, the Vice Chairman & Chief Executive Officer of SABIC. Additionally, an agreement was signed between Ultimate Solutions and Alfaisal University for the establishment of a Product Design & Development Unit. The afternoon ended with special acknowledgments and thanks to the following Alfaisal partners & friends for their tremendous support in building a research infrastructure and for their unceasing support in the development of students and faculty members; Eng. Mohammed Maher A-Masry, Country Manager, ABB in Saudi Arabia; Mr. Waqar Irshad Siddique, Chief Executive Officer, AlJomaih Shell; Sheik AlJomaih valued Alfaisal Board of Trustees Member and of the AlJomaihGroup, Dr Abdul Rahman Jazieh, Chair Dept Oncology KAMC; and King Abdullaziz City for Science & Technology (KACST).